Local heart kids step into the ring to highlight congenital heart disease. Northern Ireland children’s charity Children’s Heartbeat Trust has called on the public to get in the corner of local children who are fighting heart disease and pack a punch against the condition – Northern Ireland’s most common birth defect. 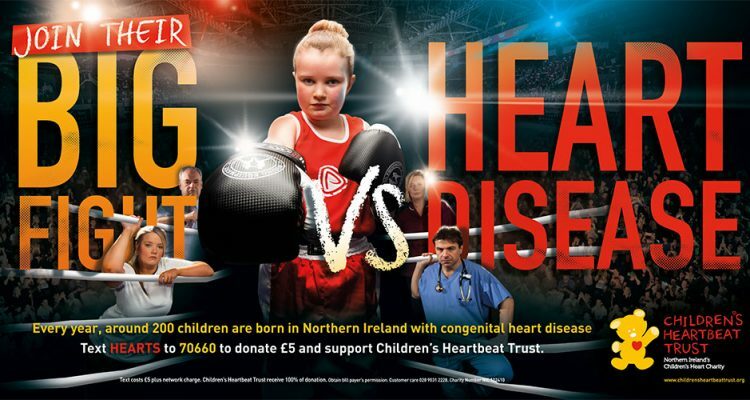 To mark Heart Week Children’s Heartbeat Trust has launched The Big Fight campaign, which sees two local heart kids step into the ring to take on heart disease. Seven year old Harry Farrell from Portadown, was born with Hypoplastic Left Heart and has been through three surgeries, while Maya Black, from Bangor who is 9, was born with Transposition of main arteries, double outlet right ventricle and large ventricular septal defect (VSD) and has undergone surgery twice. Harry and Maya can be seen on billboards and buses across NI this week as the stars of the Big Fight campaign.  200 children are born each year with congenital heart disease (CHD), making it the most common congenital condition – a condition present at birth – for children born in Northern Ireland. Many of these children will have to go through complex and invasive surgery, often at just a few hours or days old. The Children’s Heartbeat Trust provides emotional and practical support for these children and their families. Speaking at the launch of Heart Week, Katherine McDonald, interim CEO of Children’s Heartbeat Trust, said: “Across Northern Ireland there are hundreds of children growing up with congenital heart disease, and, despite their young age, many have undergone a range of surgeries and other treatments. With their families, friends and the fantastic clinical team at Clark Clinic at the Royal Belfast Hospital for Sick Children, in their corner, each and every one of them is going toe-to-toe with their heart condition. You can support Harry, Maya and all the other children with CHD by texting HEARTS to 70660 to donate £5 to Children’s Heartbeat Trust, and you can join in on twitter and Facebook by posting your pictures with the hashtag #inyourcorner. 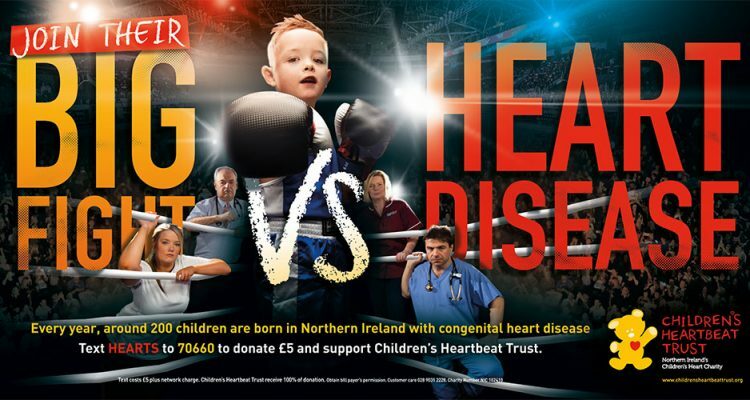 Alongside the billboards and bus t-sides which can be seen across Northern Ireland this week, Children’s Heartbeat Trust have launched a video The Big Fight, which can be seen viewed here.